With those happy memories of our Bali tour to improve our feelings towards Bali, we were ready to leave for Nongsa Point. Now that we qre legally in the country, we actually have very little time left to explore. Nongsa Point is a thousand miles away and we have to leave for Singapore by the 20th of November. We will need a fuel top up en route, but that is really all the time we will have for stopping. Hopefully, we will be able to stop at the Kumai River to see the orangutans, if only for a few hours. Our first stop will be Pulau Bawean to the north of Java. The capital of Indonesia, Jakarta, is located on Java. It is also the island for which the colloquial name for coffee is derived. I must say that our arrival in Indonesia has not brought good omens to the country. As we were travelling to Bali, we heard, belatedly, that there had been a massive earthquake off Sumatra and that the tsunami warnings had been cancelled. (Fortunately, we were at sea where we wouldn't have been affected anyway.) Then, when we arrived in Bali we learned that the volcano on eastern Java (about 100 miles from the marina) had erupted and caused damage to the Yogjakarta area. Unfortunately, we planned our departure from Bali Marina for a Friday- traditionally a bad luck day for beginning a journey. Well, we managed to get caught in the aforementioned Hallberg-Rassy jinx. As we were approaching the final red marker in the channel out to the sea, we were having difficulties locating the buoy. Somehow we managed to stray from the path and ended up with NO water under our keel- AGROUND! Luckily it was a sand bottom and we worked our way free in about 15 minutes, but the other boats back at the marina could see us and we took a fair amount of ribbing about all three HRs running aground in that channel! 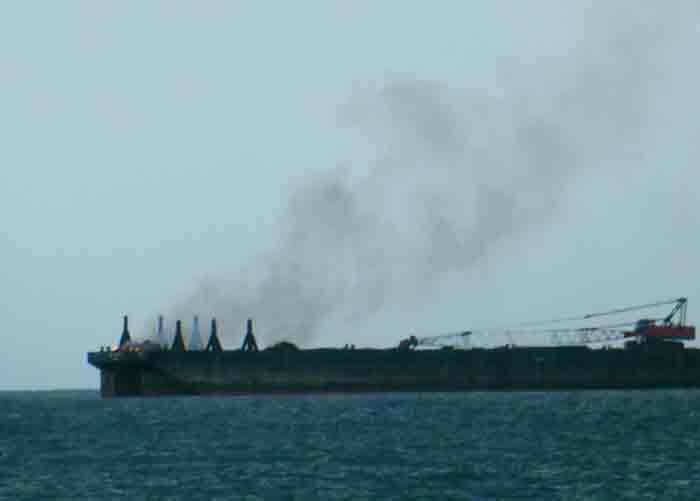 As we were approaching Pulau Bawean, Dave noticed a freighter two miles from us was belching smoke. Another small vessel was near it and neither was responding to hails. We called another freighter ten miles away and asked them to contact the freighter as it had no AIS signal and was most likely an Indonesian vessel. These local freighters do not carry the mandatory AIS and they will not respond to English. 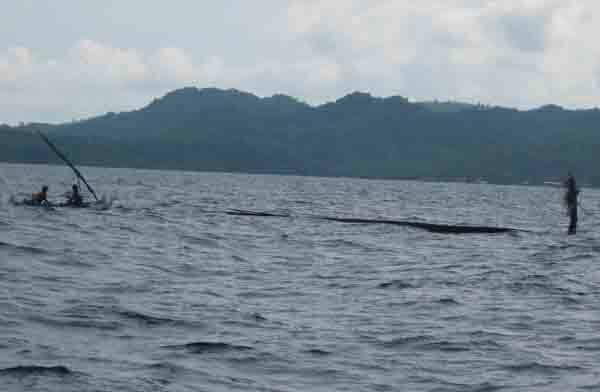 The crew of the distant tanker could speak Indonesian and discovered the vessel was about to be towed. The tow lines must have been a mile long and the freighter was being towed backwards (probably a good idea since the fire was in its bow- much safer for the towboat). We then warned MOONSHINER as they would not have enjoyed running into the tow lines. They had to divert a mile to avoid the lines! They DID get a firsthand view of the flaming bow and noticed the crew were still on board, apparently enjoying themselves. Our next obstacle came in the form of unusual fishing floats. We had already been battling HUNDREDS of fishing boats everywhere each night, including ones with extremely intense white lights which were followed up with flashing red and green lights- definitely not listed in the vessel identification charts. They resembled Christmas tree lights more than anything else. There had also been unlit nets and bamboo structures en route. Floating plastic bags had managed to incapacitate at least one of our fleet after being sucked into an intake through-hull. Now we discovered something new. We were in danger of being holed by massive logs, each sporting a jaunty vertical palm leaf or, occasionally, a small flag. They looked like floating miniature islands. We are guessing that nets or line were attached, the logs towed oput to sea and were collected when they drifted back to shore. They formed a veritable minefield ! We managed to reach Bawean intact and settled down for a good night's rest. We were hoping to purchase fuel here before continuing to Nongsa Point. WRONG on both counts. LAROOBAA had spent the previous night here and had been for a five hour tour of the island, courtesy of Mr. Customs, the customs agent ashore. Because of language problems they were unsure how to obtain fuel. It cost 5500 rupiahs (about 55c) a litre, but they couldn't figure out how to get it. So, it looks like Kumai River is going to be the next stop. As for sleep- forget it! Suddenly the seas came up and we hobby-horsed and rolled violently all night. Then, instead of leaving the next day, we decided to wait another day because of the terrible weather conditions other boats were experiencing ahead of us. Besides, the seas had been calm all day. We would sleep well tonight. WRONG again! After two nights of no sleep we are finally going to Kumai and (hopefully) the orangutans!